You already know of my love for a finely crafted party invitation but that invitation only leads up to one of my other passions…themed parties. I would say that if you were to label my life with a theme it would be probably be “Themed”. 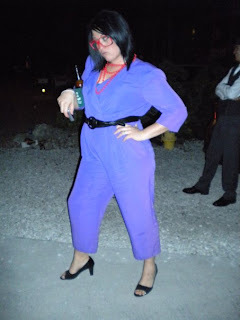 I adore a good theme party and will take any excuse to have one, but I’ve also lived my life in a series of themes. Much like the “Summer of George”, there have definitely been seasons or years in my life that carry a certain theme about them. My current theme is TBA but I’m leaning towards ‘drama’ or maybe ‘change’. I’ll get back to you on that one. This past weekend we had not one, but two theme parties. In my book that sounds like a pretty nice little weekend, granted we didn’t have enough time to stop by bed bath and beyond but it was still pretty damn sweet. 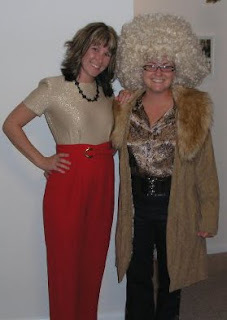 New Years Eve brought out everyone from flappers to hippies, to disco goers. 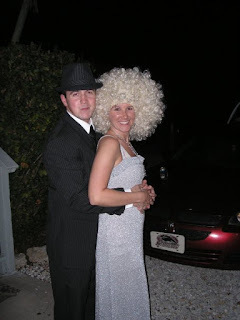 The theme was a Throwback New Year and called for everyone to dress from a decade different from this one. No-Longer-Easy-E and I even did a costume change prior to midnight which sent me from being a 1960’s hippie/pimp?? to the little heard of white member of kris kross. No-Longer-Easy-E went from being a designing woman to a disco diva in the blink of an eye. I have never been prouder of my friends’ dedication to finding great themed outfits, or more shocked that the goodwill still had some of these things in them. Saturday night was a belated celebration of Katrainwreck/The-Future-Mrs.-My-BMF’s birthday. She was kind enough to delay her b-day by a few days in order to allot people the necessary time to recover from New Years Eve (thanks for that by the way). 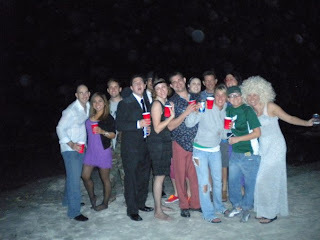 The theme was CEO’s and Corporate Hoes. This usually would have been a phenomenal idea and pretty easy to accomplish but being that the sunshine state had more freezing temps than sunshine that particular weekend it made the task of dressing like a ‘hoe’ much more difficult. My planned tiny skirt got traded in for my pin striped pants and I paired it with my power suit jacket. I know, you’re thinking how could that be slutty, you probably looked like you were all business in your suit, but I quite literally paired my pants with my power suit jacket and that was it, I forewent the shirt that normally resides underneath the jacket to accomplish the ‘hoe’ look the theme called for. The faces of those involved in this party have been removed to protect the innocent but please enjoy the mass amount of cleavage displayed for your viewing pleasure (granted a lot of it was painted on thanks to some bronzer). To wrap it up I’ll leave you with a tip….if you are talking and potentially getting hit on my a hot Canadian hockey player do not say “Oh, you’re from Canada, what’s that aboot?”, the Canadians do not like this and you will go home alone. That makes me sad and want some butterscotch.